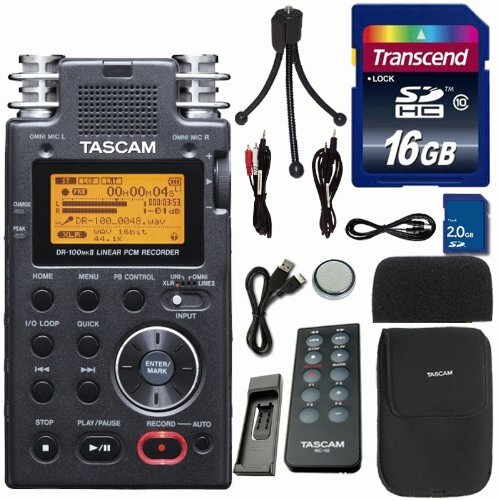 Hybrid Camera Revolution: Tascam DR-100 Mk II bundle for $250! The great Tascam DR-100 Mark II is being marked down. Perhaps due to the introduction of the DR-60D - or maybe there's a DR-100 mark III in the works - whatever the reason, this is good news for shooters on a budget who need high quality dual system sound. This starter bundle comes with a 16GB SDHC card, a carrying case, tripod and cables - and is now on sale for $250 from Sonic Sense through Amazon Prime - that's $10 less than they're selling the same bundle for on eBay and just $50 more than today's price for the DR-40. The DR-100 Mark II is a fabulous pro quality recorder for a prosumer price. Only 10 left in stock as of this post.